With its unique contemporary design, the Maple is the perfect balance of modern and comfortable for relaxed mountainside living. The Maple with loft offers 1,608 square feet of split-level living space with two bedrooms and two bathrooms and a striking architectural design. The Maples's unique contemporary design maximizes views with floor to ceiling windows and an expansive wrap-around deck. The Maple sleeps 4-5 people, plus pets. 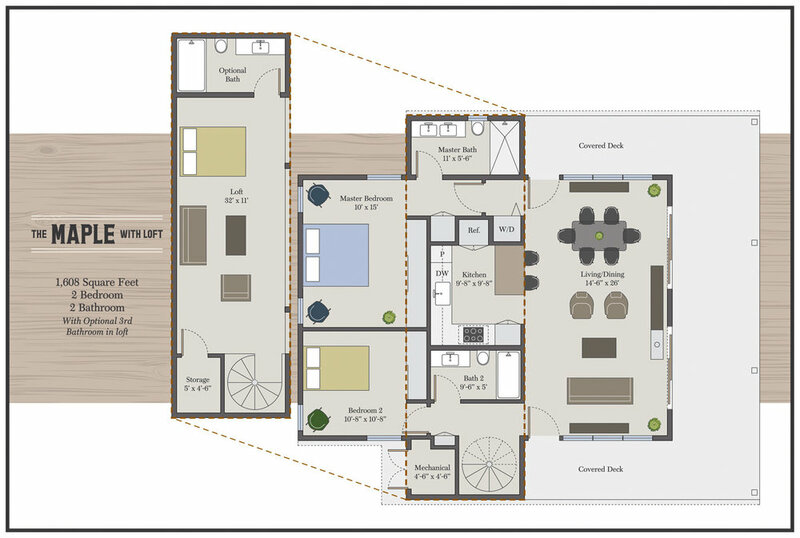 The standard layout for The Maple offers single-level living with all of the unique features and amenities of the loft option. The standard layout includes 1,140 square feet of living space with two bedrooms and two bathrooms and sleeps 4 people. The Maple with loft floor plan is artfully arranged for stylish mountain living. The Maple with loft includes the option of an optional third bathroom in the loft. The Maple standard floor plan offers a stunning modern floor plan with open living and an expansive wraparound deck.